Big week on the bike. Two long days, two recovery, and a MTB ride. Taking it week by week. The massive jump was water weight. I lost 9# on my Sunday ride. I also purchased a Whoop recovery wrist strap and subscription. I believe my problem has always been inadequate recovery so I’m giving this thing a shot. So far it’s been telling me what I already feel. After Sunday’s crushing ride yesterday was a “red” day (take a break). Today is a yellow (do some lighter aerobic work), and tomorrow should be green (do a hard workout) if I play my cards right today. I also turned 40 Friday. So that’s fun. Rough plan for this week is a easy 30-45min ride on the trainer Tuesday. 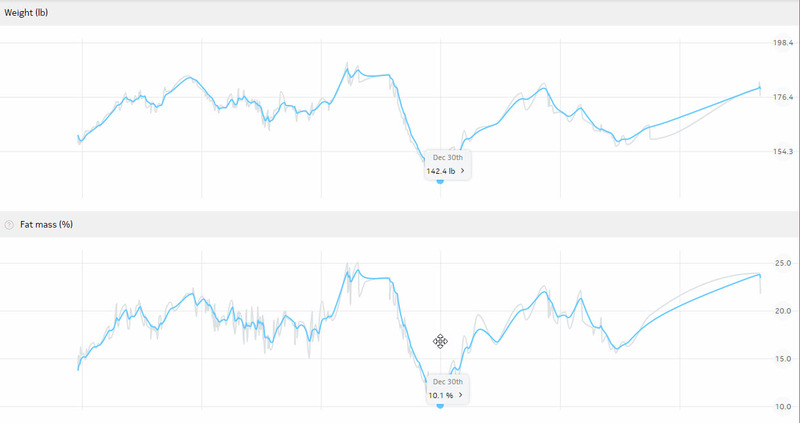 VO2 intervals Wednesday, easy ride Thursday and Friday. Crush myself either Saturday or Sunday with a 4-5 hour ride. Had a good week last week. Got my power meter pedals installed so I can confirm that my aerobic fitness is terrible. Just got to keep plugging away. Mostly just riding along super easy (HR ~130). Wednesday I did a VO2 max workout on the trainer. Sufferfest’s “A Very Dark Place”. It’s a simple 5x4min VO2 workout. I plan to do that once a week and maybe throw in something like Sufferfest’s “Hell hath no fury” (2x20s) to mix it up. This does make me wonder if it’s possible to make meaningful aerobic improvements while losing a significant amount of fat weight. Last time I undertook this process in 2015 my aerobic fitness did not change at all. How’s the weight loss coming? It’s falling off as I planned. Next DEXA is October 12th. I should be just into high 160s by then. I am guessing 168 or so. Monday is here and I’m feeling FLAT. Still riding slow trying to keep my heart rate under/around 135. Pulling my 3 year old around in the bike trailer reinforces the slowness. Diet has been going well. Snacking is mostly gone and I’ve been able to stick to “no eating after dinner”. Since we eat around 5:00PM (thanks kids!) this gives me a solid 12 hours without food every day. Starting to play with my indoor training setup. I’ve never been able to “just ride” on an indoor trainer. I always need a structured workout to get through. I’ll do a weigh in tomorrow. If i see averages around 175 this week I’ll know I’m still on track. Still heading in the right direction! Did around 10 hours on the bike last week / weekend. Got a 4.5hour ride in on Sunday and a couple other 2 hour rides at a SUPER slow pace. I’m attempting to actually follow the MAF approach. For me, at 40 years old and my current shape that means riding around at 135 BPM or lower for hours on end. I’m embarrassingly slow but in all my years of training and stagnation this is the approach I have not tried correctly. I’ll do a MAF test this week (warm up for 15 mins, ride at 135 BPM for about 30 mins, cool down for 15, record power). By my next DEXA scan in 6 weeks if I’m doing this correctly there should be a nice power improvement at that heart rate. And now for the pictures. 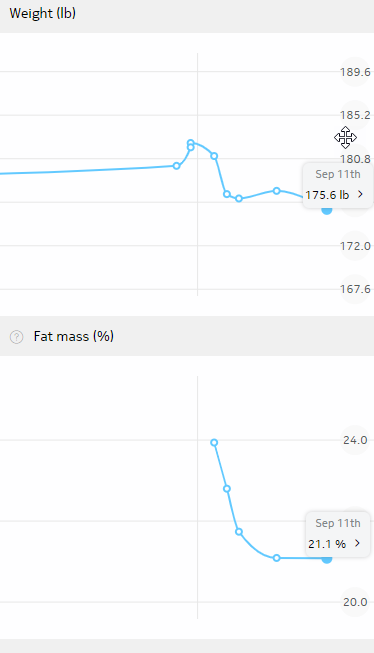 This is an image of my lifetime graph from my Withings scale. 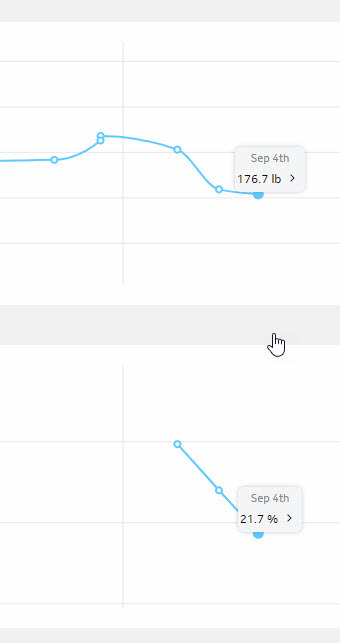 I’ve highlighted my lowest weight at the end of 2015. I only lost .5LB of muscle according to all of my DEXA scans when I lost all that weight. And here is my last 30 days picture. So I had my first DEXA scan today. It was not pretty. 31% body fat, nearly 54 pounds of the stuff. I had some success with my current approach in 2015, and a failed attempt in 2016 when I tore my AC joint downhill mountain biking. It’s day four of not drinking & no snacking after dinner. I keep trying to grab a handful of chips on my way by the kitchen but remind myself NO. 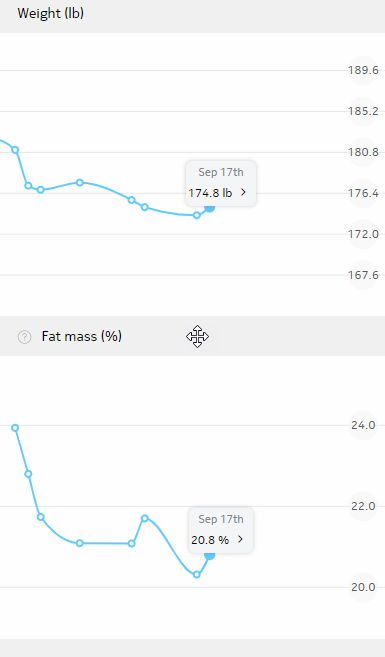 I on ce again find myself in the familiar position of having to lose a bunch of weight. Excuses abound but really I just stopped caring over the last two years. My target race weight is right around 140# and 10-11% body fat based on previous DEXA scans and experience. I was here in January of 2016, having hit 186 after having our first son and moving to Denver from the east coast. 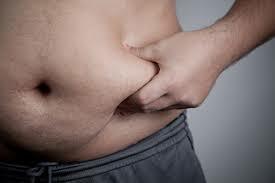 I was able to maintain 1-2 pounds per week of weight loss until I hit 150 and then it slowed WAY down. So what is my plan? Start simple. Start working on the aerobic base riding the bike super slowly for around 10 hours a week. 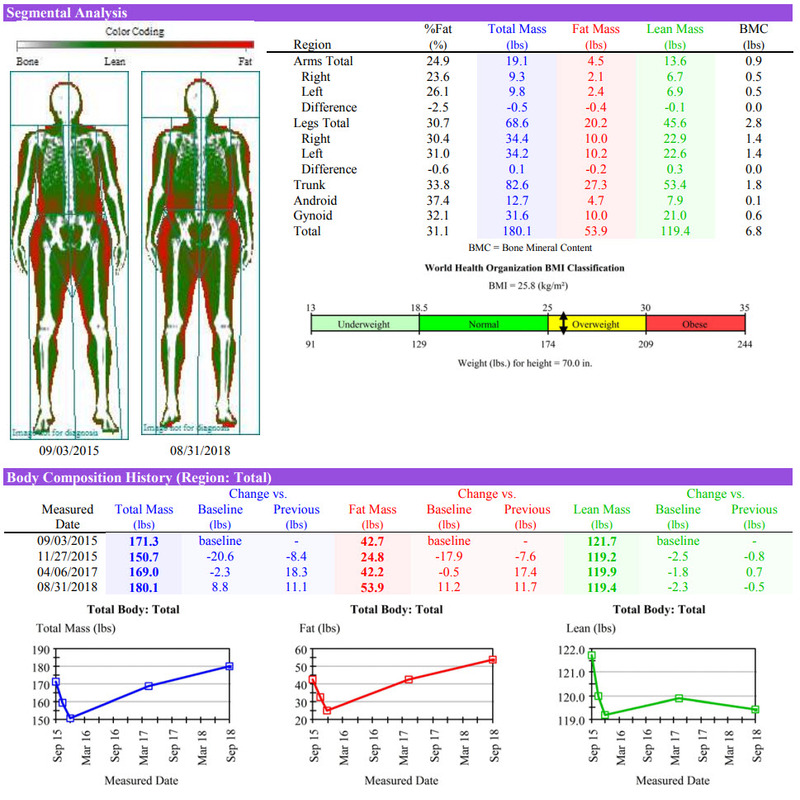 I have a DEXA scan scheduled for tomorrow and I will schedule a follow up every 6 weeks, it really helps me stay on track and focused. I will be stepping on the scale every day. 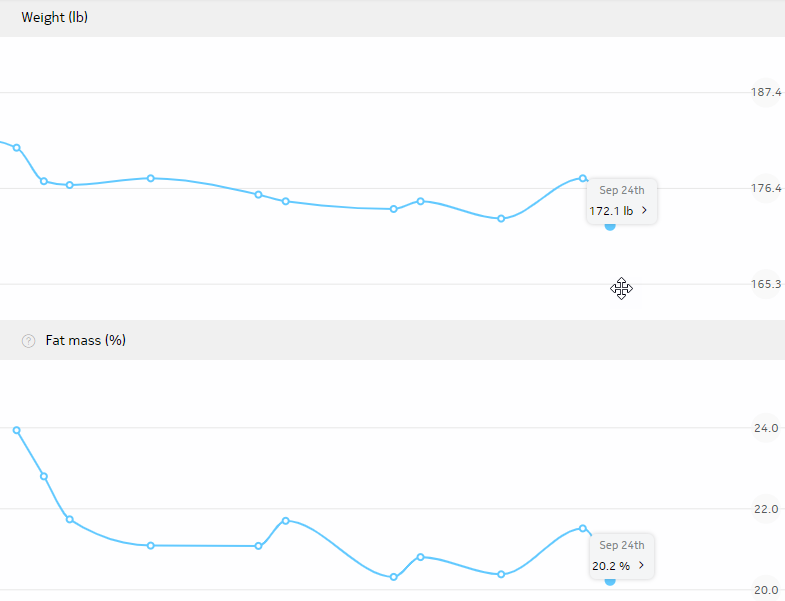 Maybe there is some WordPress widget that will upload my current weight. Yes a lot of people say thats overkill, useless, demotivating, etc. Not for me, I believe you really do get what you measure. So, here we go. I’m putting this out into the world in hopes that it serves as another point of accountability.